Lush released two cleansers as a part of their Christmas Collection this year, Let the Good Times Roll* (reviewed here), and Buche de Noel*. My first impression of Buche de Noel wasn't amazing, but after using this cleanser for about 6 weeks, my opinions have definitely changed! "Fans of Angels on Bare Skin will love this Christmassy take on our best-selling classic facial cleanser. 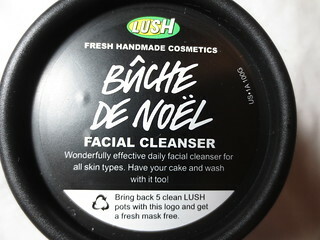 Perfect for all skin types, Buche de Noel is the cleanser that’s good enough to eat (although we don’t recommend it). Named for the log-shaped French dessert, ours is loaded with fresh ingredients for glowing holiday skin. Sorry, no buttercream here! Ground almonds gently exfoliate away dead skin while kaolin clay acts as a mild, deep cleanser. Then we add almond oil and seaweed to nourish and moisturize seasonal dry patches and leave skin softer than a freshly fallen snow." 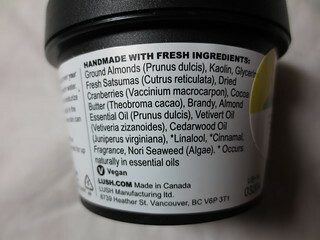 Lush's cleansers aren't traditional, and I know that many people stay away from them because they are so unfamiliar. Buche de Noel is a solid cleanser wrapped in seaweed. I'm not sure why the seaweed was used to hold the cleanser together, since this comes in a pot anyway. I'm not a huge fan of the scent of this cleanser, but I know a lot of people just love it. Take a sniff of it in a store to see how you get on with it. 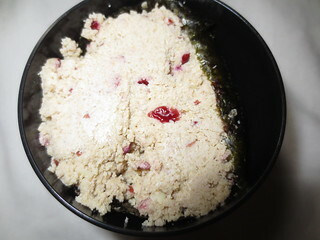 To use this cleanser, I take a generous chunk, and mix it with warm water to create a paste. I then apply it to my wet face, and massage it in. I find that this does a pretty good job at removing my makeup (foundation, blush, etc. ), but I always remove my eye makeup with a separate product first. Buche de Noel contains ground almonds and cranberries, which act as gentle exfoliants. I think that even people with sensitive skin would benefit from this cleanser, since it is so gentle and non-irritating. This is a limited edition product, so get it while you still can! A 100g pot will cost you $12.95, which I think is quite reasonable. The shelf life of this cleanser is about 3 months, but I have heard that you can freeze them. I've been using Buche de Noel first, and then Let the Good Times Roll for a deeper exfoliation (my skin loves being exfoliated! ).